Q: How do I connect with other people with hearing loss? 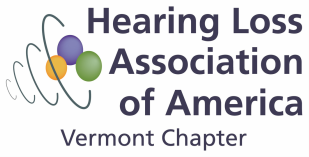 Create or Join a VT HLAA gathering near you! Email us! Q: What are communication strategies for hearing loss? http://www.audiologypractices.org/used-alone-hearing-aids-fail-to-deliver Scroll to bottom to find: "12 Critical Communication Strategies for Patients with Hearing Loss"
Samuel Trychin's Living With Hearing Loss Program . "Hearing loss is a communication disorder affecting everyone in the communication situation"
Q: What is Vermont doing for people with hearing loss? Q: Where can I watch captioned movies? Captionfish "The Internet's leading captioned movies search engine for open captioned, Rear Window®, USL, CaptiView®, foreign/subtitled, and descriptively-narrated movies." Q: Where can I find Hearing Loops in Vermont? Meeting room, Whiting Library, Chester. Groups may reserve the large meeting room. Ask for instructions on using the hearing loop, which is served by a table top microphone. Let us know of more hearing loops! Q: Where do I get my hearing tested? What should I look for in an audiologist? Which hearing aids should I buy? Where can I find reviews of hearing aids? What do professionals have to say? Hearing Tracker, a searchable database of all hearing aids and audiologists, complete with ratings and reviews. "Consumer Reports estimates that as many as two-thirds of hearing aids in the US are misfit". Hearing Tracker is working to identify and highlight providers that embrace best-practice guidelines. Vermont's Speech-Language-Hearing Association has helpful links for the public. Q: What if I have a problem with my hearing aids? HLAA: Know what consumer protection laws are available in your state. In Vermont, you can file a complaint about hearing aid dispensers at the Office of Professional Regulation. Q: How do I afford hearing aids? Vermont Voc Rehab typically will pay $1,000 towards hearing aids, and if you purchase from their partner audiologist, there is a deep discount as well. Applicants typically must be trying to get or keep a job, or be youth transitioning towards the workforce. Q: What free legal resources are available to help me access my rights to accessibility and healthcare? National Health Law Program "Our lawyers and policy analysts stand up for the rights of the millions of people who struggle to access affordable, quality health care. "